Rwanda is located in central and eastern Africa. Located a few degrees south of Equator, it shares its borders with Uganda to the north, Tanzania to the east, Burundi to the south, and the Democratic Republic of the Congo to the west. The Republic of Rwanda is an east African nation with an incredibly long history, dating back to around 8000 BC. The early people of Rwanda were a Pygmy tribe, the Twa, followed by the Bantu tribes during their great migration from about 700 AD. These early Bantu tribes included the Hutu and the Tutsi clans, who lived in Rwanda along with the Twa. From these clans arose kingdoms in the 15th century. The Tutsi kingdom, the Kingdom of Rwanda gained power throughout the 18th century and expanded in the next century. The Hutu and Tutsi clans began to clash as the Tutsi gained power. Rwanda became part of German East Africa in 1884, and was explored around 1894. In World War I, the territory was taken over by Belgium, which colonized the country and introduced many changes. The colonists also increased the tensions between the Hutu and the Tutsi as separate groups. After World War II, Rwanda moved toward independence, though the dispute between the two clans grew violent. The Rwandan Civil War broke out in 1990, with a brief ceasefire from 1993 to 1994, but soon continued. Many were killed during the war and many more fled as refugees to other countries. The 2000s saw reconciliation and improvements across the country. 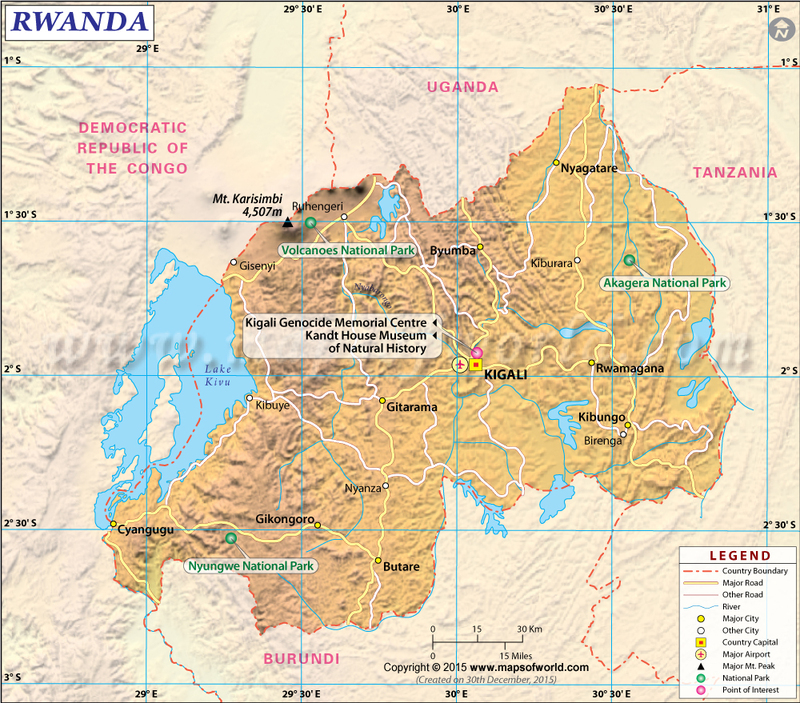 The Republic of Rwanda borders Uganda, Tanzania, Burundi, and the Democratic Republic of the Congo. Rwanda is located near the Equator in east Africa, and features a subtropical climate. The terrain is mountainous with savannas along the east. The mountains along the west are the Albertine Rift Mountains, with its highest point, Mount Karisimbi standing 4,705 meters (14,757 feet) above sea level. The Virunga volcano chain is located along the northwestern part of the country. Other terrain in Rwanda include savanna, swamps, and hills. Rwanda is a landlocked country with several rivers and large lakes. The main rivers of Rwanda include the Nyabarongo, the longest in the country, and the Kagera. Some of Rwanda's important lakes are Lake Tanganyika, Lake Victoria, Lake Burera and Lake Ruhondo. Lake Kivu, the country's largest lake, is also one of the world's deepest lakes. Rwanda is home to many natural sites of scenic wonder, including its many lakes, forests, and mountains. The Parc National des Volcans, a national park of Rwanda, is home to mountain gorillas which can be seen on one of the many treks offered. The Nyungwe Forest is a mountain rainforest, home to a large population of chimpanzees. Akagera National Park near Kigali is home to a variety of wildlife including giraffes, zebras, and hippos, and other animals typical of African safaris. The rapidly developing capital city, Kigali, offers a palace museum and cultural experiences, as well as dining and lodging. Some important places to visit to learn about Rwanda's civil war history are the several genocide memorials, including the Nyamata Genocide Memoria, Ntarama Genocide Memorial, and the Genocide Memorial in Kigali. The main airport of Rwanda is in Kigali, which offers international flights to Brussels and Amsterdam, as well as several African cities like Johannesburg and Addis Adaba. Bus is a good way to get into Rwanda from neighboring countries, including Uganda, Tanzania, and Burundi. In towns, there are bicycle taxis called taxi-velo, motorcycle taxis called taxi-moto, and sometimes car taxis. There are also minibuses called Matatu throughout the country. Rwanda's road network includes paved roads between major cities, including the capital, Kigali, to several cities and locations across its borders. The official flag of Rwanda was adopted on October 25, 200. It consists of horizontal bands of blue, yellow and green colors with a sun in the blue band.